A military coup deposes Isabel Perón as President of Argentina and instates the most brutal dictatorship either Argentina or Latin America has ever seen. At least 22,000 people are killed or disappeared during the first three years after the coup alone. The dictatorship lasts until 1983. 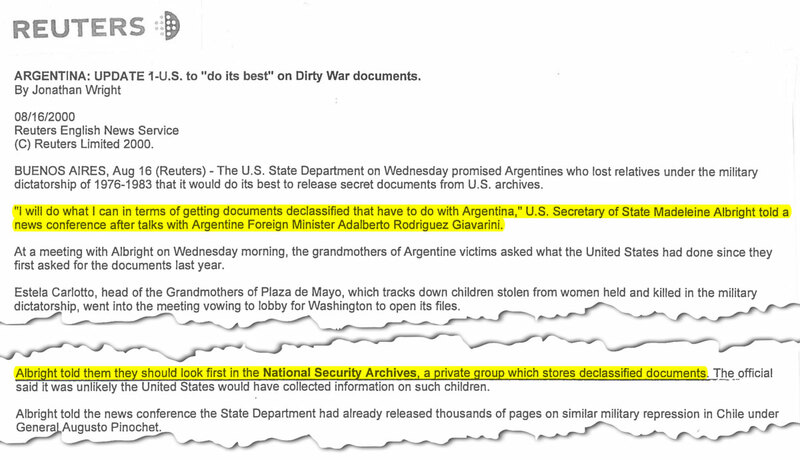 Secretary of State Madeleine Albright tells the Grandmothers of the Plaza de Mayo, a group that works to locate grandchildren stolen during the dictatorship, to first look for relevant documents at the National Security Archive. Albright also announces at a press conference that the State Department will “do its best” to produce documents on the “Dirty War” in Argentina, but that it is not the only agency with records on the dictatorship. 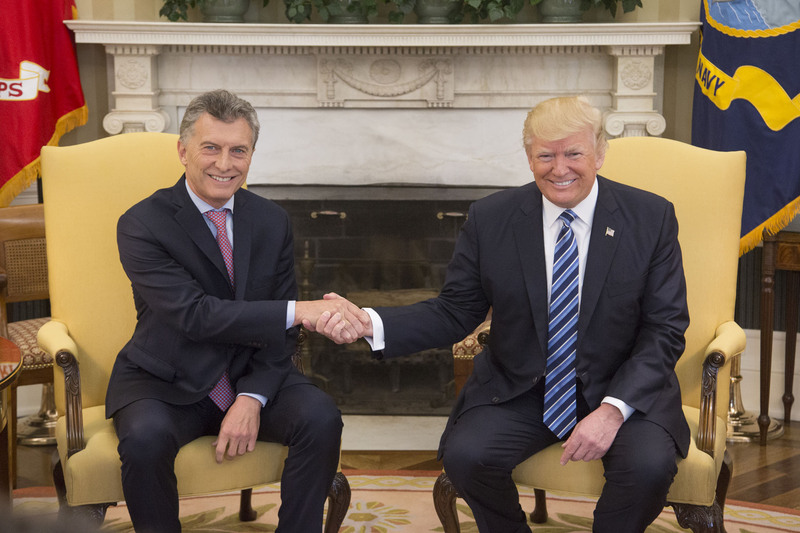 Argentine Junta Felt Safe From the U.S. The State Department releases 4,700 records. 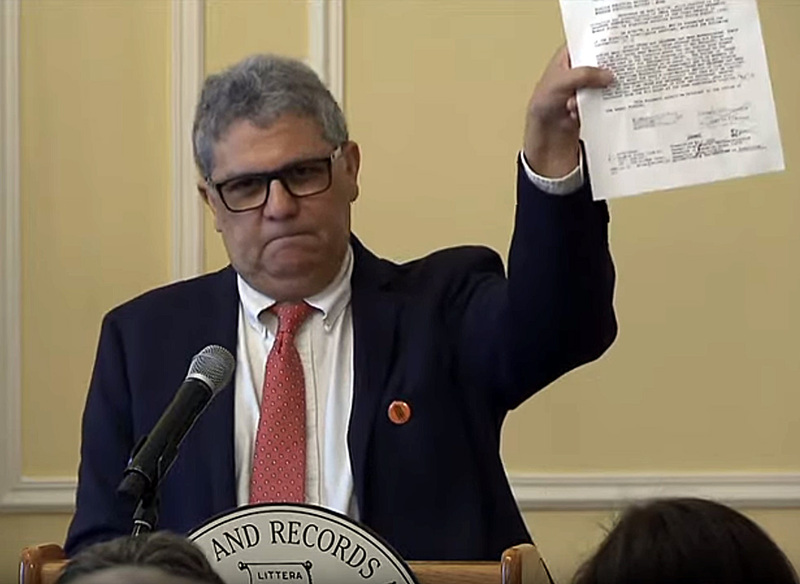 The documents are a treasure trove of information that help clarify human rights violations committed by the dictatorship. The State Department release leaves out policy decisions but do reveal a remarkable level of knowledge by the US government about the abuses. 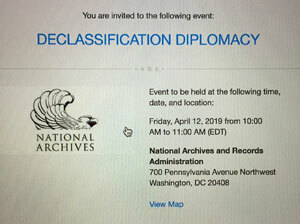 Intelligence and military agencies do not join the declassification process. 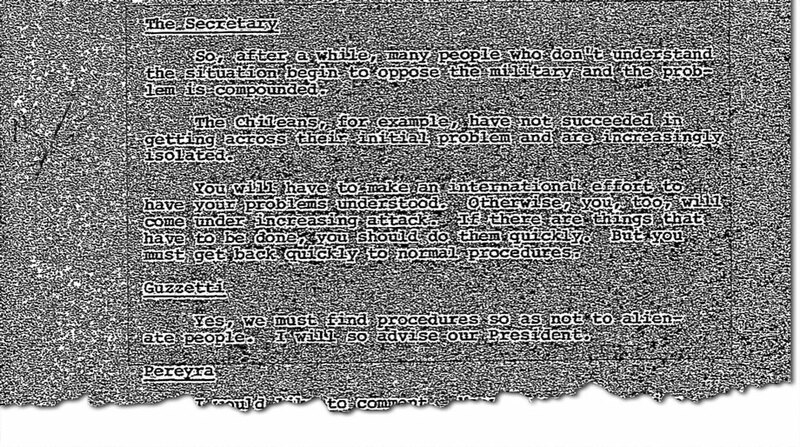 Kissinger to The Argentine Generals in 1976: "if There Are Things that Have to Be Done, You Should Do Them Quickly"
The National Security Archive publishes former Secretary of State Henry Kissinger’s June 10, 1976 memo telling the Generals on the dirty war "if There Are Things that Have to Be Done, You Should Do Them Quickly." 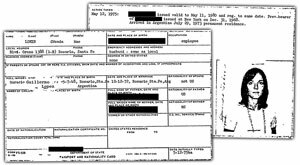 1978: Operación Clandestina de la Inteligencia Militar Argentina en México. 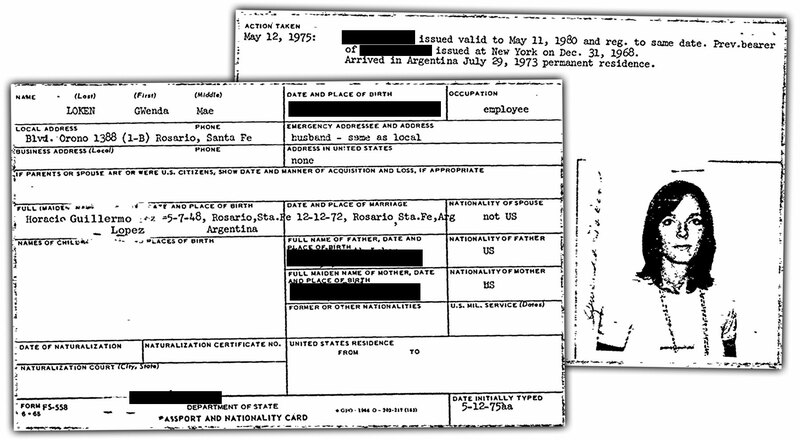 The DFS mugshots show the Argentine agents along with their false names: "Manuel Augusto Pablo Funes, Deputy Area 121 of the Argentine Army Intelligence," and "Miguel Vila Adelaide, Civil Intelligence Area 121 of the Argentine Army." This chart of the unit "Reunion Center" within Intelligence Battalion 601 shows the numerous Task Forces that were responsible for scores of kidnappings and disappearances across borders in the Southern Cone. 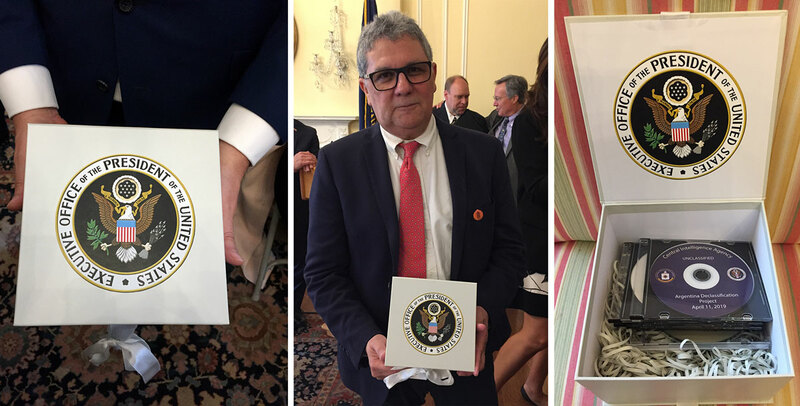 The Argentine Embassy awards Carlos Osorio, the Archive’s Southern Cone project director, a special award praising his "contribution in the fight for human rights during the Argentine civic-military dictatorship." 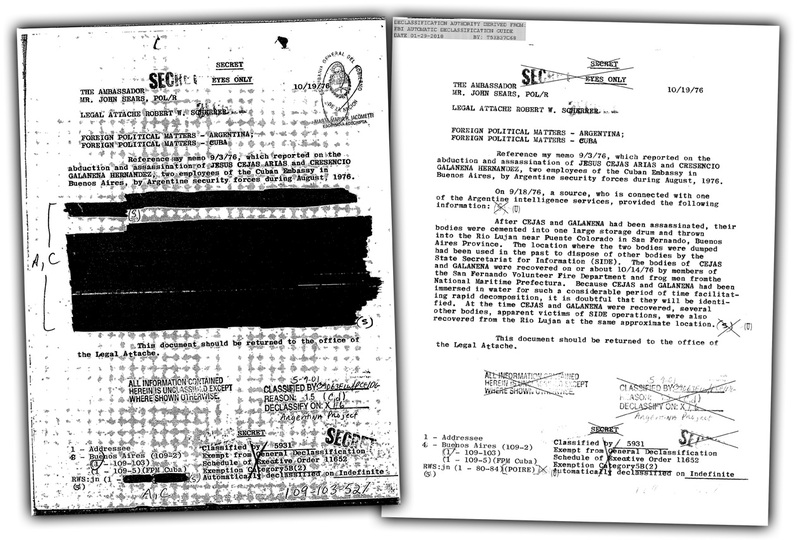 "Operation Condor is the code name given for intelligence collection on leftists, communists and Marxists in the Southern Cone Area. 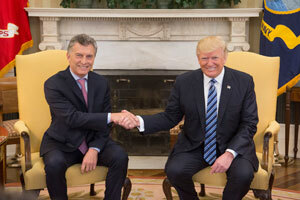 It was recently established between cooperating intelligence services in South America in order to eliminate Marxist terrorist activities in member countries with Chile reportedly being the center of operations. Other participating members include: Argentina, Paraguay, Uruguay and Bolivia … Members showing the most enthusiasm to date have been Argentina, Uruguay and Chile." Osorio presents evidence and testimony in a trial in Rome, Italy, on Operation Condor which victimized dozens of Italian Argentine citizens. The Office of the Director of National Intelligence releases the first tranche of documents resulting from President Obama’s directive. 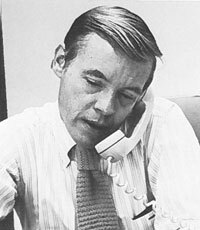 The release consists of 1,078 pages, primarily from the Carter Presidential Library. The Office of the Director of National Intelligence releases the second tranche of documents resulting from President Obama’s directive. 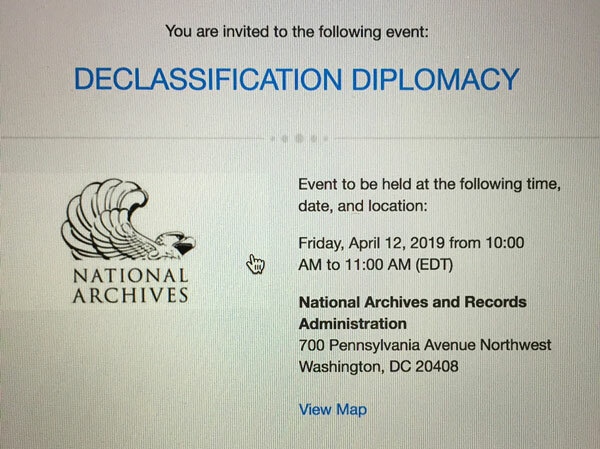 The release consists of approximately 550 pages of documents from the Carter, Ford, Reagan, and Bush presidential libraries. 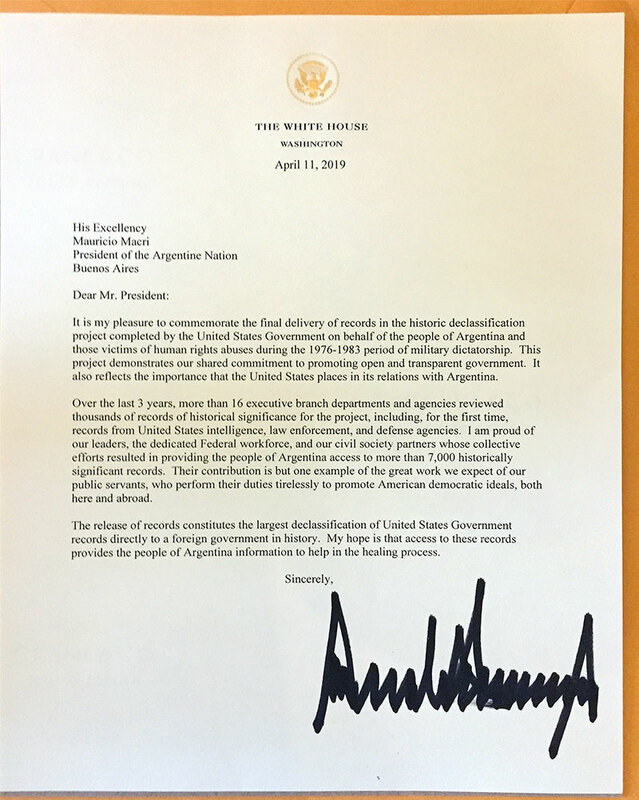 The Trump administration releases 931 State Department records and gives them to Argentine President Mauricio Macri during his Washington trip. 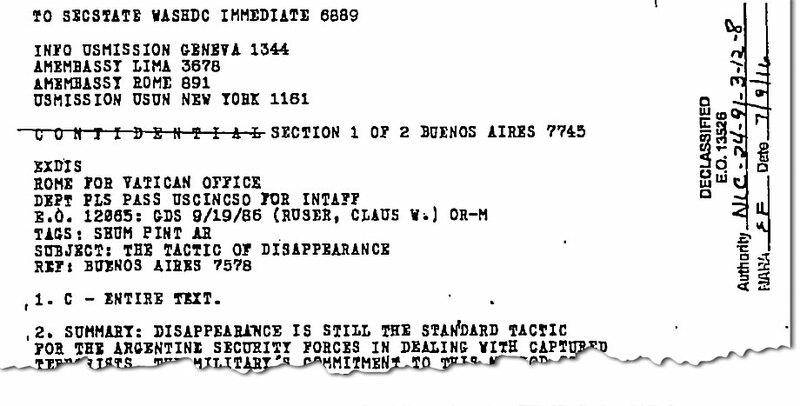 The release includes a re-review of 857 documents previously withheld in part or in full from a release carried out by the Department of State in 2002, and 119 high-level documents selected for inclusion from two chapters of a forthcoming Foreign Relations of the United States (FRUS)volume on South America, 1977‒1980. * These documents were identified and described with the help of undergraduate students from the College of William & Mary as part of a research internship led by Professor Silvia Tandeciarz and assisted by Johanna Weech. We would like to acknowledge the following students: Arianna Asfari, Emily Jackson, Pedro Ramos, Isabella Dickens-Bowman, and Johanna Weech (Spring 2018); Lauren Bauer, Grayson Cox, Emily Kate Earls, Brianna Ferebee, Molly Keck, Megan Leu, and Johanna Weech (Spring 2019).